The Financial Services industry has a long history in terms of its relationship with sport through sponsorship. 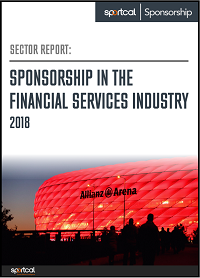 With close to a billion dollars spent on sponsorship deals between financial services firms and rights holders, Sportcal Sponsorship has examined the Financial Services sector, focusing on 30 key brands responsible for over $1tn worth of revenue, with a view to understanding the major trends as well as looking at potential future developments. and is priced at £500.00 for a single user license. If you require a license for more than one user please contact us.